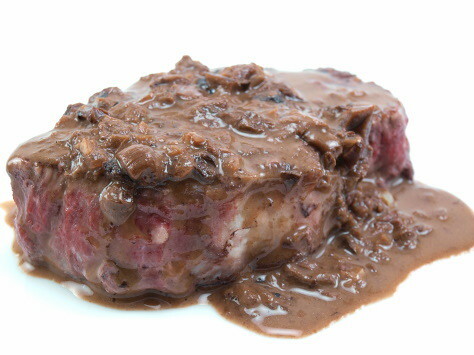 Home » BBQ » Seared Filet with Mushroom Cream Sauce and a Giveaway! **UPATE** The winner, as selected by Random.org, was comment 14 – Brad! Congrats to you! It is getting down to crunch time for Christmas and I know I have been getting some last moment gifts together for my friends and family. 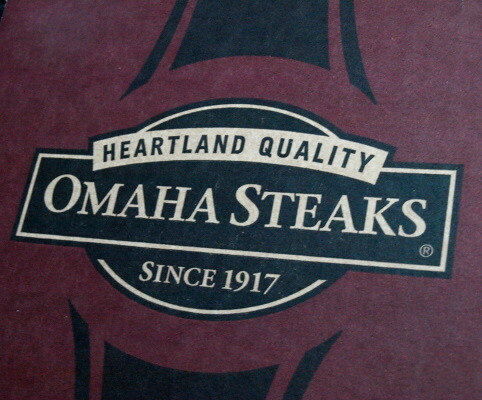 Win $50 worth of steak from @Omaha_steaks & @BakingBlog! http://bit.ly/8ZA0dN #OmahaHoliday Pls RT! Post a comment back here leaving me a link to your tweet, so I know you participated. That’s it! This giveaway is sponsored by Omaha Steaks. The giveaway ends December 21, 2009 at 11 pm CST. The winner will be selected at random and notified via email no later than December 22, 2009. You can enter once daily through the end of the contest. Good luck! With the opportunity to give away $50 from Omaha Steaks I also received some steaks to try. They sent me four 6 ounce Filet Mignons. 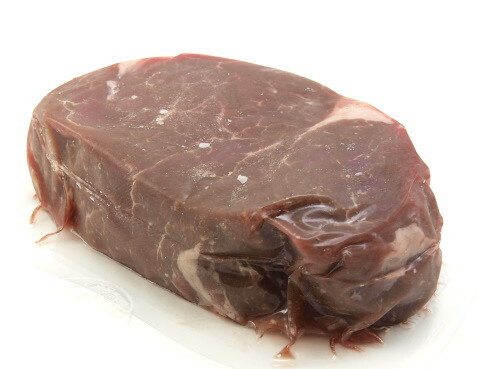 I love filet because of the delicate flavor and tenderness. 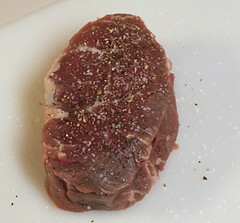 The Omaha Steaks were much more tender and juicy than I expected from a frozen steak. While they were not quite as tender as some of the fresh steaks I get at my local butcher they were by no means tough. The steaks also had a nice flavor, and once cooked I could not really tell it had been previously frozen. 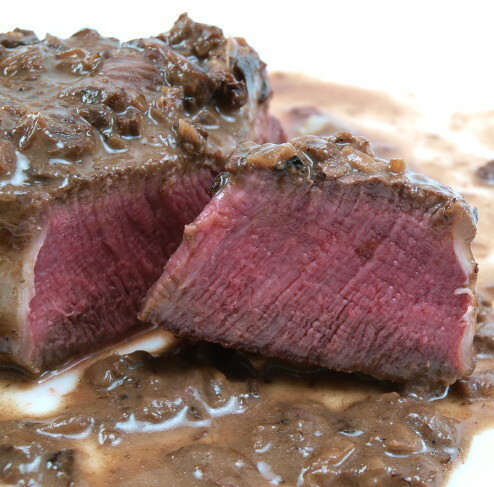 While I find filet perfect with just some salt and pepper, I know other people find the flavor a little bland. With that in mind I decided to come up with the perfect sauce to compliment the delicate flavor of the meat. What I came up with is rich and velvety. The creaminess works well with the tender meat. You can serve this sauce with other cuts of beef, or with pork if you prefer. It is adaptable and very tasty! 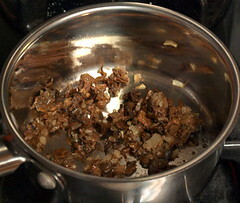 In a heatproof bowl re-hydrate the mushrooms in two cups of boiling water. Allow to stand for ten minutes before draining and chopping. In a saucepan heat the olive oil over medium high heat until it shimmers. 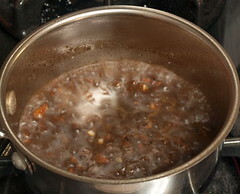 Add the minced onion and cook until soft, about three minutes. Add the mushrooms and saute until the mushrooms begin to brown. Add the garlic and cook for thirty seconds more. Deglaze the pan with the beef stock, making sure to scrape all the brown bits off the bottom of the pan, then add the wine. 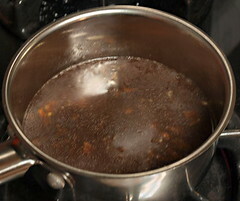 Allow the mixture to come to a boil and reduce by 3/4 stirring occasionally, about ten minutes. While the sauce reduces prepare the steak. Pat the steak dry with a clean towel and season both sides with salt and pepper. Heat the canola oil in a heavy skillet over medium high heat until it begins to shimmer and just starts to smoke. Add the steaks and sear for two minutes per side. Transfer the pan to the heated oven and cook until you reach the desired level of doneness (I cooked mine for four minutes in the oven and reached medium rare). Tent the cooked steaks with foil. 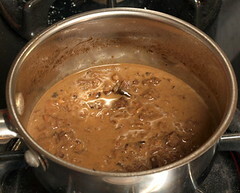 Once the sauce has reduced add the butter and stir until completely melted. Reduce the heat to medium low and add the cream. Bring the sauce back to a simmer. 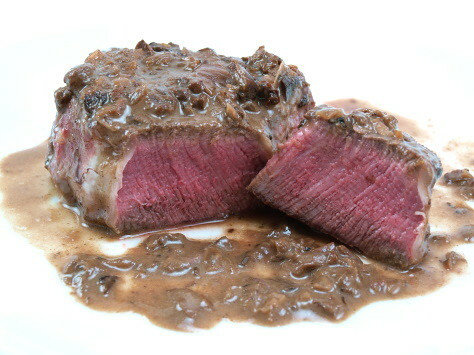 Serve the sauce over the seared steak. Enjoy! Evil Shenanigans Product Review Policy and Disclosure– I received this product at no cost from the manufacturer, or other PR firm, for the purpose of testing and reviewing the product. I did not accept monetary compensation for reviewing or writing about this product. Any opinion expressed is my own and is not influenced in any way by the manufacturer/PR firm. I only review products that I have personally tested and endorse.